I’m trying to fit a rectangular peg into a slightly differently shaped rectangular hole. It’s not easy. The two holes aren’t exactly aligned. A fair bit of shaving, chiseling and sawing is in order. Eventually everything will fit. I just need persistence. The requirement is a tight but simple fit. if I want this piece of furniture to be portable (and I do), then the wedges and tenons and mortises have to fit pretty exactly. But they also need to be able to come apart so I can fold the thing down and stick it in the back of the car. Why in the back of the car? Because partly this is a shelf for stuff at home, and partly it’s a shelf for stuff at events that I go to, like the one I went to this past weekend. It would have been really useful to have a shelf in the place I was — then I would have been able to find the tools and materials I wanted, instead of rooting around in my bag each and every time. They could have been laid out on a shelf for easy access, and I wouldn’t have been late to everything because I couldn’t find what I was looking for. tight mortise? Or, fat tenon? It’s been several days since I could work on this bookshelf. My hope was to have it finished by tomorrow. No such luck, alas. Instead I’m working on a combination of tenon-shaving and mortise-widening, trying to hit the sweet spot where the boards all fit correctly. 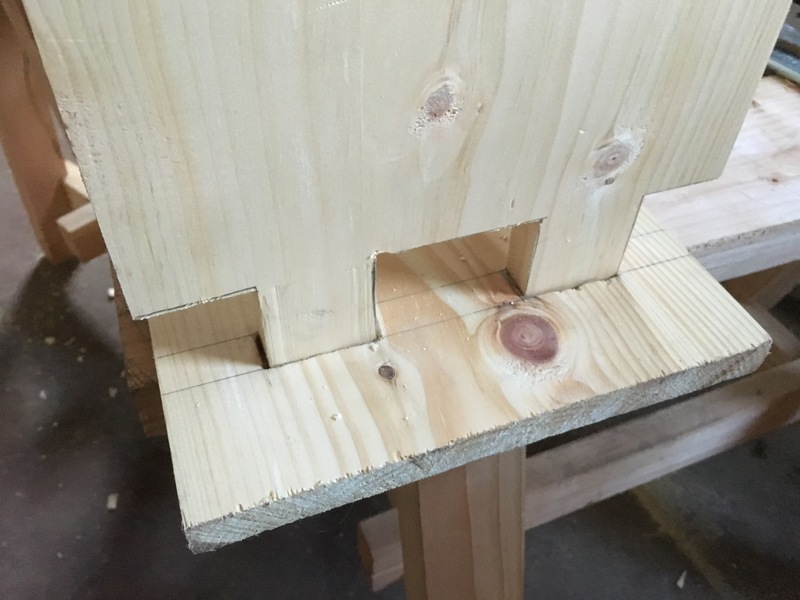 Widen the mortises too much and the shelf wobbles in the joint and doesn’t hold the shelf square. Shave the tenons too much, and they’ll be too weak to hold the weight on the shelf. 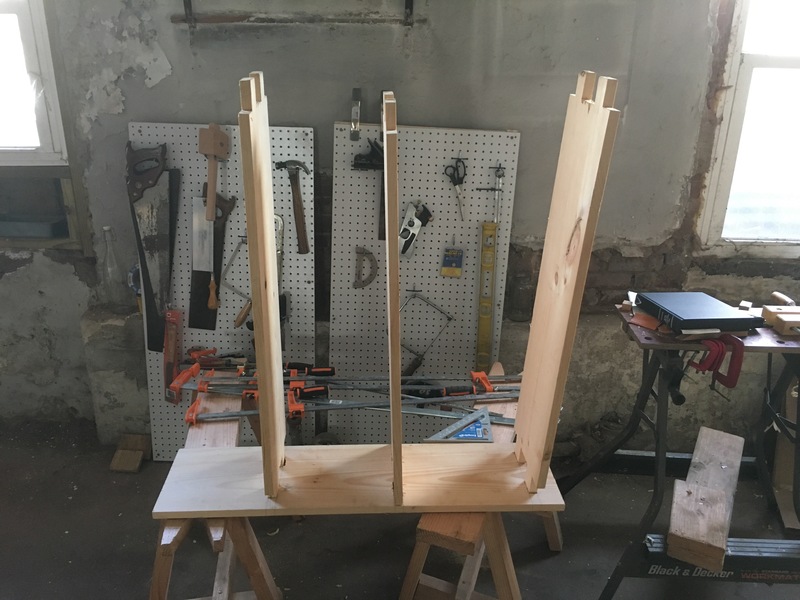 Additionally the tenons will eventually have holes for wedges, to help square each shelf and hold the whole piece of furniture together. 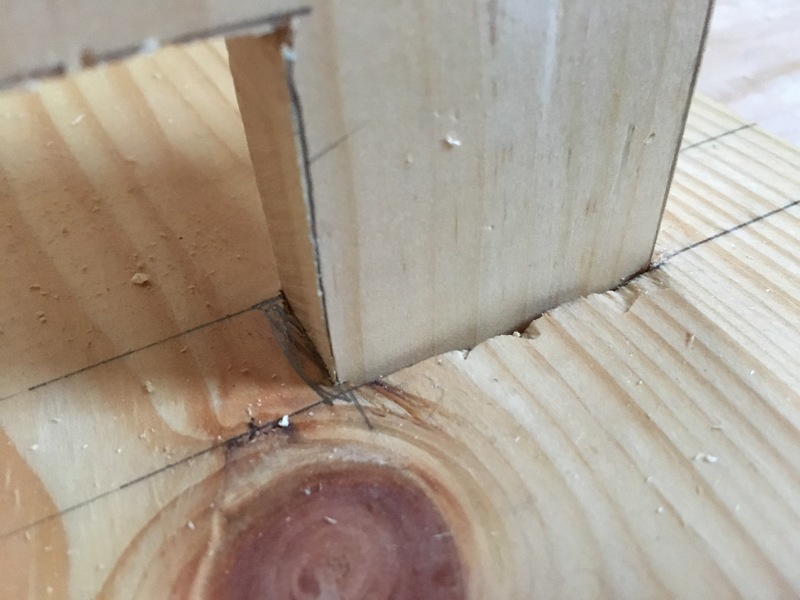 I still have a lot to learn about carpentry, particularly this kind of “fine joinery” — all of what I’ve done so far is mere apprentice work. So now what? Well, next steps are pretty simple: get the tenons to fit the mortises on one side. Drill the tenon holes and clean them up. Make wedges. Square up the left side of the bookshelf. Prop the shelves and square the right ends. Mark and drill and clean up the mortises in the right side of the shelf. Fit the shelf tenons into the right side. Drill out the wedge holes and clean up. Decorate, with either chip carving or something else. Sand. Finish, either with paint or with varnish of some kind. All of those are examples of knowing how rather than knowing about. I spent a lot of time in my life learning about: reading books and trying to understand “about” sorts of questions: why an American Revolution? Why an English Civil War? What is Brexit? Who was Alexander Hamilton? And so on. Questions about something are increasingly easy to answer. They belong to Google, and to the sites that Google helps you find; and though a skilled knower-about — an expert — can help you discern right from wrong about answers, or better from worse about answers, they can’t show you how to do something they haven’t done themselves. And the learning-how is costly in terms of time and attention and focus. 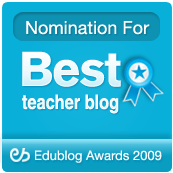 So how is your school or library integrating knowing-about with knowing-how? How are you integrating it? My experience has been that knowing how is an aide to knowing about; and that knowing about improved the quality of the work I know how to do. But your mileage may vary. It’s getting there. I think my big challenge at the moment is trying to decide between a largish Forstner bit to chop out the waste from the wedge-holes in the tenons, or a smaller bit to make holes at the corners, and then use a coping saw or skill saw to cut out the same. A smaller bit and a coping saw seems to be the way to go, though. In general, I’m finding that I have more use for a powered skill saw than I’d like. I’d prefer to do work by hand — but I’ve just finished cutting a set of dovetails, pins and tails all by hand, only to find that they don’t line up well at all with each other, and that it’s going to take a fair bit of chiseling and sanding to get them all to fit. Argh. In general I tend to drill the bulk of the waste in my mortises, then finish them with a chisel. It’s difficult (at least for me) to cut a strait line with a coping saw, so I think that method would leave as much work to fit the mortise to the wedge in this case. Either way will work fine in the long run. You also may want to consider tapering the wall of your mortise to match the taper of the wedge. It would assist the wedge at pulling everything together.